Talking ABC is an iPhone app developed by Jutiful, with animations by+energetic- Animation Studio. This alphabet learning app is aimed at kids aged 2-7. 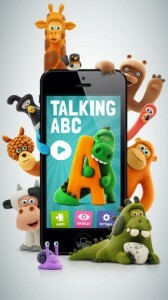 Talking ABC is a charming app for kids. 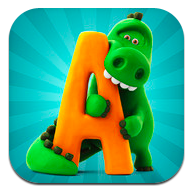 Boasting a interactive claymation alphabet, this app is a great way to teach young learners their ABCs. These colorful characters make learning much more fun than staring at boring old letters by themselves! Each animated character has their own unique voice, and the app features a whole host of claymation critters like a walrus, a bear, a koala, and an alligator. This wide range of animals teaches the alphabet, while also teaching kids about wildlife in a very subtle way. 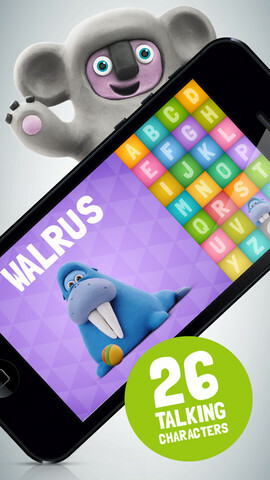 In addition to four fun games, kids can also develop a personal connection to the app by seeing their own name spelled out in clay. This personal connection will make them like the app even more, because it makes them the center of attention. The most recent version of the app is Version 1.2. This was a big update, because the develoeprs removed all social elements (Facebook, Twitter, Gift App) from the interface. This was done to keep parents sane and keep kids off of social networks until they are older. 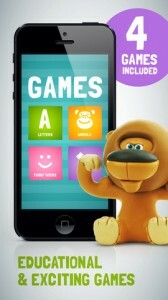 Now, you can leave your kid alone with this app and not have to worry about what else they might be doing with it. With its great interface and charming claymation characters, Talking ABC definitely deserves your attention. If you have toddlers, preschoolers, or kindergarten kids, this app is a great place to start their journey into the world of reading. It’s cute, and educational: how great is that? 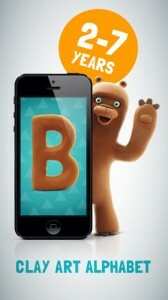 Talking ABCis compatible with iPhone, iPod touch, and iPad. Requires iOS 4.3 or later. This app is optimized for iPhone 5.